The beauty of this jumpsuit by VILSHENKO is that it's an outfit creator. The ruffle cap sleeve, wrapped bow detail and additional buttons make a look for you. We love it with the Navy Petit Alistair Supreme Bag by Clare V. .
Sized: 6-12, British sizing, one length available. Regular measures 53'' from shoulder to hem. Black printed cotton (70% Cotton, 30% Silk). Jumpsuit. Flutter sleeves. Crew neckline. Front button and front tie closure. Partially lined. 53” from shoulder to hem. Imported. This jumpsuit is so comfortable and fit perfectly. It looks exactly like the picture except there's a subtle black polka dot pattern and it fit me about an inch longer in the legs (the cuffs are loose so you don't end up looking like Princess Jasmine). 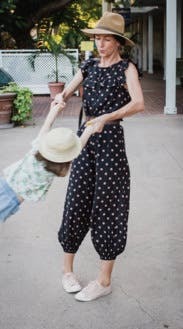 Normally, jumpsuits and rompers are riding up where they don't belong, but this one was great. Just leave yourself plenty of time for the bathroom because you have to unbutton the front to get it off! Very fashionable yet felt like I was wearing pajamas. Only complaint is that to take it off you have to undo all the buttons in the front. Not ideal if you're planning to wear all day. Received a ton of compliments! Super cute pattern and great fit! 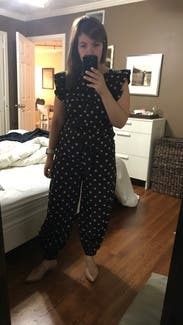 I rented this jumpsuit for work and absolutely loved it! The pattern and material were both super cute and the fit was perfect. 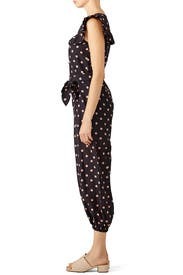 Adorable, versatile jumpsuit that I wore once to work and once to brunch. Perfect except that you need to undo ALL the buttons to use the restroom. I thought it looked tiny bit like pajamas- but husband loved it! Actually wore it to two different dinners. Can pair with flats or heels. Way to short in the waist. I am long waisted and this was way too short to even consider being comfortable. I even sized up but there's no way I could wear this. This jump suit surprisingly fit me well. I am nearly 5'8' and the torso was just long enough. Warning: mine didn't come with belt. So I imagine I would have worn it a couple more times, but instead I am going to send it back after wearing for an afternoon of running errands. This is such a unique piece and very fun to try. I had a hard time finding shoes to match but this is great with slides or even sneakers. It is more comfortable than I expected and had a lot more room throughout than I thought. The fabric is lightweight and this can easily be packed away for a vacation or worn throughout the day comfortably. I highly recommend! 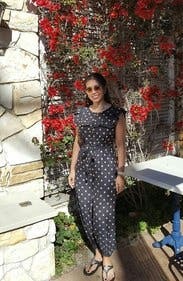 I love this jumpsuit! It is cute with the designs and details on the shoulder and the material was very comfortable it almost feels like wearing pjs! But the belt made a lot of difference once it cinches on the waist as without the belt would definitely look like pjs! The material is very light so perfect for summer or early fall weather! Great for a day of walking outside (used it for vacation). I did not mind the buttons as others had mentioned. It was still easy to get it off and put it back on compared to other jumpsuits that I wore. Make sure you get the belt right. The fit was great. I'm tall, skinny with a long torso and I was worried it won't fit me but it was perfect. It's playful, flattering, comfortable and versatile. With the right accessories it can be an evening outfit just as a daytime/work. Came without a belt. The print was not dots as I thought but a tiny sweet roses. Got a lot of compliments from both men and women! Loved the fit. I paired it with a wide red belt, red flats and a straw hat! worked great! 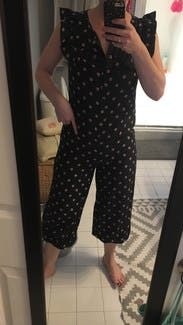 the only thing I did not like was the elastic was tight on the bottom and would constantly ride up so at points there was a harem pant effect going on but wouldn't stop me from wearing again! so fun, cute, and comfortable. Would have kept it forever if not for the price! 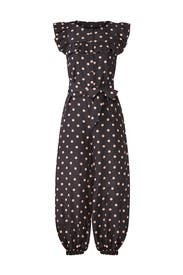 This jumpsuit is so much cuter in real life. I thought it was polka dot but the dots were actually tiny little roses (which didn't look at all twee). The fabric was lovely and soft and breathable. However, I was unable to wear it (boo!!) 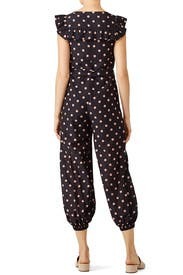 because the torso part of the jumpsuit was too short for me and was literally giving me a very unattractive wedgie! Such a shame because I really loved it. I am 5'7" and 120lbs and rented the size 6 which otherwise fit perfectly. I would certainly try renting it again and this time try the 8 because even though its billowy it comes with a belt and I think you could cinch it in a way that would make it fit in both width and length.